Goniodysgenesis is a development abnormality of the anterior chamber of the eye characterised by narrowing or closure of intraocular channels of the iridocorneal angle (ICA) though which the aqueous humour drains. The increased ocular pressure damages the retinal ganglion and could therefore result in primary glaucoma and blindness. In the breed Border Collie, a mutation in the olfactomedin-like 3 gene (OLFML3) has been found to be associated with the genetic predisposition to severe goniodysgenesis. The OLFML3 matrix protein is known to be involved in protein-protein-interactions, cell adhesion and intracellular interactions. 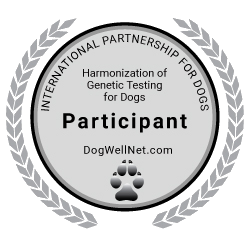 Since few dogs tested as heterozygote carriers have been diagnosed with goniodysgenesis (but no glaucoma) and several dogs show severe goniodysgenesis but remain glaucoma free over a life span of 15 or more years, the development of a glaucoma seems to be influenced by a combination of genetic, environmental and/or random factors. Moreover, the OLFML3 variant could not be associated with mild goniodysgenesis indicating that the mild form is caused by another genetic disposition.